"Star Showers" Photo © Barbara Van Cleve. All Rights Reserved. Oh Lord, I've never lived where churches grow. Audio Source: Buckaroo – Visions and Voices of the American Cowboy. Edited by Hal Cannon and Thomas West. Callaway / Simon & Schuster, 1993. "First Light" Photo © Adam Jahiel. All Rights Reserved. Sat a bunch of fellers spinning yarns to pass the time away. Some of them praised Chicago town and other’uns New Orleans. And he would listen eagerly to what they had to say. "I'd like to be in Texas for the roundup in the spring." They knew that feller settin' there had once been wild and gay. And he slowly removed his hat and quietly began. I was foreman on a cow ranch, that's the calling of a king. I'd like to be in Texas for the roundup in the spring. A grove of leafy cottonwoods her constant vigil keeps. When we rode the range together like two skipping kids at play. I hear her laughter freshening the dew of early light. And left her cold and lifeless by the crossing on the Red. I hear some coyotes neighin', and I hear the night guard sing. I laughed with joy as I looked at her! From San Saba's shore to LaVaca's tide. Is like this Lasca, this love of mine. And -- sting of a wasp! -- it made me stagger! In Texas, down by the Rio Grande. The vigorous vintage of Old Spain. One does not drink in little sips. Who falls in front of their mad stampede! Of my swift mustang without a word. I sprang to the saddle, and she clung behind. Away! On a hot chase down the wind! Clinging together -- and, what was the rest? Stately and still like a ship at sea. For the things that are like the things that were. 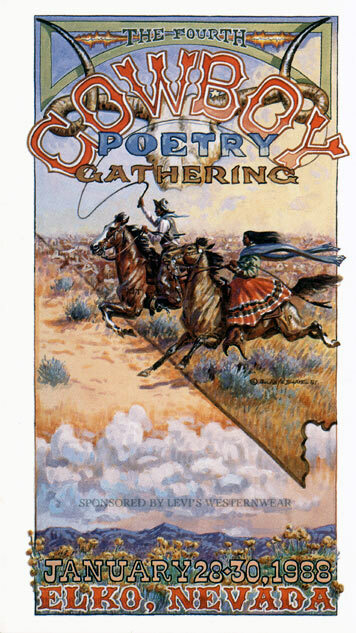 Audio Source: Oldtime Cowboy Poetry by Sunny Hancock. Of a long summer day that was then almost done. Sorta restin’ one leg with their head hangin’ down. Was a-tryin’ to sing, and they’s both out of tune. Scratchin’ the dirt were some chickens and sparrows. Like they felt plumb contented in body and soul. You could see the high mountains with snow on their crest. And that sure made a right pretty picture at that. An’ he figured he’d ought to put on a big show. He aimed to take outta there with his horse on the run. Until after he’d got his old pony on track. An’ got rid of that cowpuncher, saddle an’ all. He was bit by two dogs (which he didn’t expect). Where a team that was hitched to a wagon rared back. And a-swingin’ the broke ends of two hitchin’ straps. And the dogs was all chasin’ that runaway team. He was yellin; and jumpin’ and wavin’ his lid. And he got out of the way-- but he made the team swerve. An’ they busted the winder an’ several things more. Piled up in a heap with the wagon on top. But the crowd went to work and they got ‘em untangled. Why, the storekeeper come out with plenty to say. The man with the team owed the store man a bill. An’ he sure wasn’t bluffin’, he got in an’ tried. That the storekeeper come off a mighty poor second. Just in time for a drink when the whole thing was done. And the afterglow showed on the snowy old peaks. Where the townfolks was cookin’ their supper that night. And the stars hung in clusters so bright that they blazed. You could hear the slow footsteps along the board walk. And one after another, the lights went to rest. On the best of all places, an old western town.